Does the Old Fashioned Have to Be So Old? Let’s talk about the Old Fashioned: it is a simple combination of sugar, spirit, water and bitters that is near and dear to my heart. It’s a topic that has seemingly been done to death, I know, but what I want to point out is that this drink, while storied and venerated, needn’t be prepared in such an old fashioned way. Does the Old Fashioned have to be so old? Nearly every article written about this drink praises its now antiquated method of construction. Purists rattle on about lump sugar, bitters and soda water muddled together. Sure, this is the way the Old Fashioned was first made and there are, in fact, some who still do it this way and produce a wonderful drink. David Moo of Quarter Bar in Brooklyn (676 5th Avenue near 20th St) best represents the Old Fashioned preparation and its merits because he and his staff take great care and spend the time to really build that perfect slurry of sugar, water, and bitters for each drink. Moo, in fact, goes the Full Monty by also incorporating a brandied cherry and an orange slice and his version, which is included in Robert Simonson’s list of the best Old Fashioneds in New York. But does that mean that it’s still the right way for everyone? Most bartenders rush the muddling process, so the sweetness of the sugar never properly incorporates with the whiskey leaving the customer with an aggressive drink in place of the soft beauty that an Old Fashioned should be. Why overlook innovation? Why let tradition dictate action if you don’t take the time to properly honor that tradition? Any time saved in the muddling process means a less elegant cocktail. I wouldn’t dare to suggest editing the ingredients list, merely streamlining the process by which the drink is constructed. There is a reason nearly every bartender (myself included) at every cocktail bar worth frequenting has forgone the lump sugar and muddler and looked, instead, to the faster, simpler syrup. Syrup means: no muddling, even distribution of sugar throughout the cocktail, less chance of an overly diluted or watered down cocktail and a drink presented to the guest in much less time. Employing syrup is a faster and less labor-intensive means to the same end. After all, what exactly is the point of muddling the sugar, bitters, and water together in the first place? That’s right! You’re building a syrup in the glass. As a Bartender at Long Island Bar, a high-volume cocktail bar in New York, I know a thing or two about building drinks at speed. I make about 7,823 Old Fashioneds per shift (give or take). It’s the most popular drink order by far. It is my job to get those 8,461 drinks into the hands of thirsty guests as quickly as possible. That speed does neither me, nor the guests any good if each of those 9,506 Old Fashioneds doesn’t taste the same. It is a combination of speed and consistency for which the bartender must strive. Building a 2:1 Demerara Syrup before service begins helps the bartender achieve both of those aspirations. Removing the muddling step saves time, though a skilled bartender can be expected to employ a muddler at speed. Omitting this step perhaps better serves the home bartender who is entertaining guests. After all, less time working and more time enjoying the company of his or her guests is a key to a great party. Now lets look at the matter of consistency: I suppose you could compare those perfectly square Domino sugar cubes to a similar volume of syrup but refined white sugar has never been my particular favorite in an Old Fashioned. In fact, I have found that most bars worth drinking in employ an unrefined, demerara style sugar in their Old Fashioneds. Unrefined sugars offer a bit more in the way of rich molasses flavor. This sugar can be found in lump form and in those conveniently measurable little squares, thus making it possible to use the same amount in each drink. However, failing to employ uniformly sized sugar cubes leaves each cocktail different from the last. Syrup is easily measured to the exact amount intended per drink. Add one more notch to syrup’s belt. So there you have it. 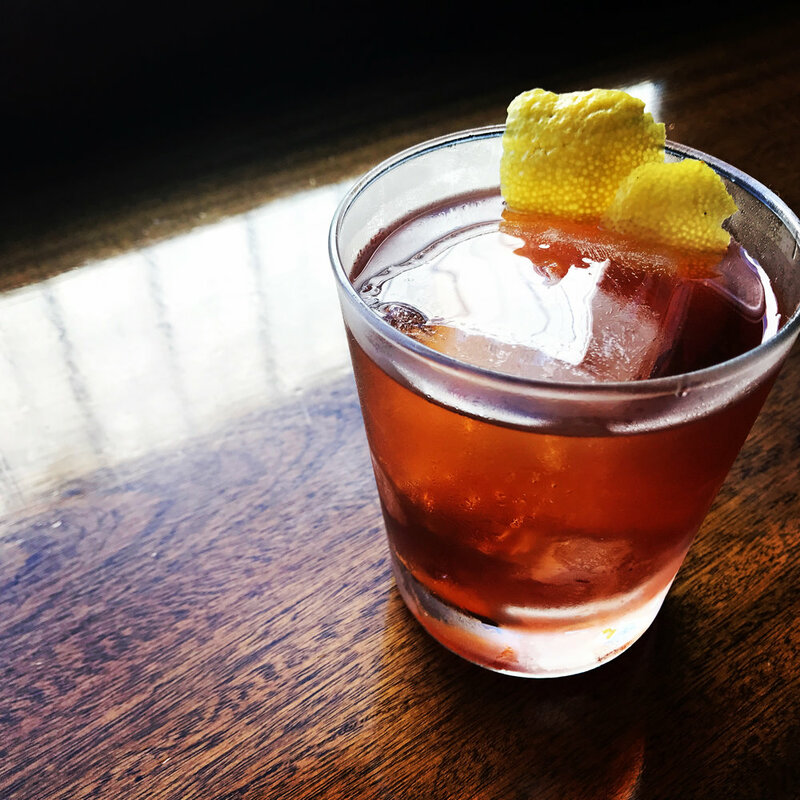 If you aren’t having a drink in one of the Unicorns of the bar world, like Quarter Bar, you will find yourself much happier with a modern approach to the oldest of cocktails. Syrup makes a great drink faster with a more consistent result thus getting the professional bartender on to the next customer’s order and the home bartender out of the kitchen and back into the company of his or her guests. Combine all ingredients in a mixing glass. Add ice and stir to chill and dilute. Strain into a frozen, Double Old-Fashioned glass containing one large ice cube. Garnish with a lemon and/or orange twist. Combine sugar and water in a saucepan over medium heat. Stir until sugar is completely dissolved, being careful not to bring to a boil. Let resulting syrup cool and then use in cocktail or refrigerate. Will keep up to a week.